Brisbane is where it's at right now. This weekend the Queensland Ballet celebrates its International Gala, the 15th year of the event, with a display of "virtuosic dance in its many forms" and a host of guest dancers, including Daniel Gaudiello, Paul White and Chantelle Kerr, who have trained and danced with Queensland Ballet. Also in Brisbane is Portrait of Spain: Masterpieces from the Prado, hosted by the Queensland Art Gallery, which Prado chief Miguel Zugaza described as "one of the most creative and dynamic art museums in the world". The exhibition – which investigates the evolving identity of Spain from 1550-1900 – is the first from the Museo Nacional del Prado to be shown in the Southern Hemisphere and features more than 100 masterpieces, including Christ carrying the Cross by Cristo con la Cruz a cuestas, circa 1565. The exhibition concentrates on war, religion and nobility. And for the diary: the 50th Brisbane Writer's Festival (5-9 September; tagline 'Celebrating the heart of the story'). A potential highlight? Germaine Greer, the former Bishop of Edinburgh Richard Holloway, federal politician Bob Katter, magistrate Jacqui Payne, writer Benjamin Law and criminal defense investigator Rachel Sommerville in a lively and passionate debate adjudicated by Roland Sussex titled 'Reading the Bible is good for you...'. Keep up with the news via Facebook. Laura Moore's winning portrait. Image, with thanks, Portrait.gov.au. Sydney artist Laura Moore, 25, has won the iD Digital Portraiture Award for a self-portrait in which she poses as her school-girl self. 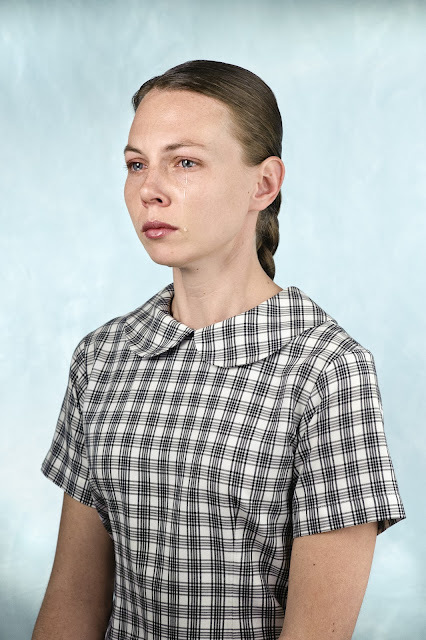 Her misty eyes, freckles and plait make a compelling depiction of the traditional school photo. In order to capture a series of still photos conveying the raw emotions of her high school years, she sat in front of the camera for hours recalling her more miserable experiences. "I wanted to do something that was real, that felt real - like I was being honest," Moore said. "I wasn't compromising - that's why I decided to go all the way with it," she said. The judges noted the portrait, one of 60 entries and five finalists, was easy to identify with. Hosted by the National Portrait Gallery, Canberra, the awards are open to young artists aged 18 to 30 with an interest in digital realisations of portraiture. Self-portraiture and family portraits have proved popular. As the 18th Biennale of Sydney – "Australia's largest and most exciting contemporary arts event" – continues, Juliana Endberg has been appointed artistic director of Biennale 2014 with chief executive Marah Braye crediting her "curatorial wit and incisive perspective on presenting exhibitions in unique buildings". The director of the Australian Centre for Contemporary Art in Melbourne, Endberg will maintain her ACCA position while also tackling the biennale role, through which she hopes to imbue "some drama, some realism, some emotion – a rich bouillabaisse of an event, with some meaty bits and some lighter bits" (The Australian). Held every two years, the Biennale is a three-month exhibition, complemented by a program of artist talks, performances, forums, film screenings, family events, guided tours and other special events. It is free to the public. 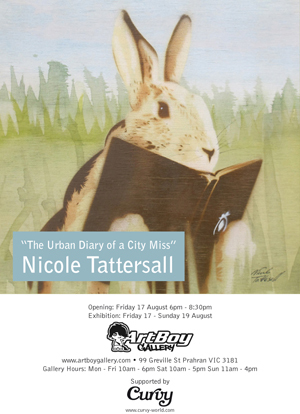 Artist and illustrator Nicole Tattersall is holding an exhibition called "The Urban Diary of a City Miss" from Friday August 17 to Sunday August 19 at Art Boy Gallery, Prahran, Victoria. "I've been busy working towards my first solo exhibition in almost two years," says Tattersall. Loosely inspired by the book The Edwardian Lady by Edith Holden, the work – which features stencils cut and sprayed from her own photographs of animals, illustrations, paintings and photography – represents 12 months of her life. "The year long challenge was to translate and convey my personal thoughts, experiences, surroundings and wildlife observations into a visual diary,” she says. Accompanying each piece in the show is a brief 'diary entry' explaining its significance. You can watch a video Nicole put together in anticipation of the exhibition here. 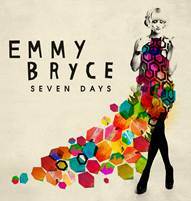 "Hit the Ground", the catchy, sunny new single by Melbourne lass Emmy Bryce that featured on Channel Ten's Offspring, follows "Every Star is a Setting Sun to Someone" onto the pop playlists of girls and guys who like their music with a spoon full of sugar. In May, Emmy won the "Pie Face Pie Jam" competition, which will see her record with legendary engineer/producer Kalju Tonuma (Temper Trap, the Living End, 28 Days, Evermore), which is a long way from recording compositions on her parent's dual tape deck as a 13-year-old. Emmy has gigs in Melbourne, Sydney, Canberra and Adelaide during August and September, where she'll be joined by Lucy B and supported by Andrew Lim. Check out emmybryce.com for details or like her Facebook page. Print is dead? Not so, Fred. 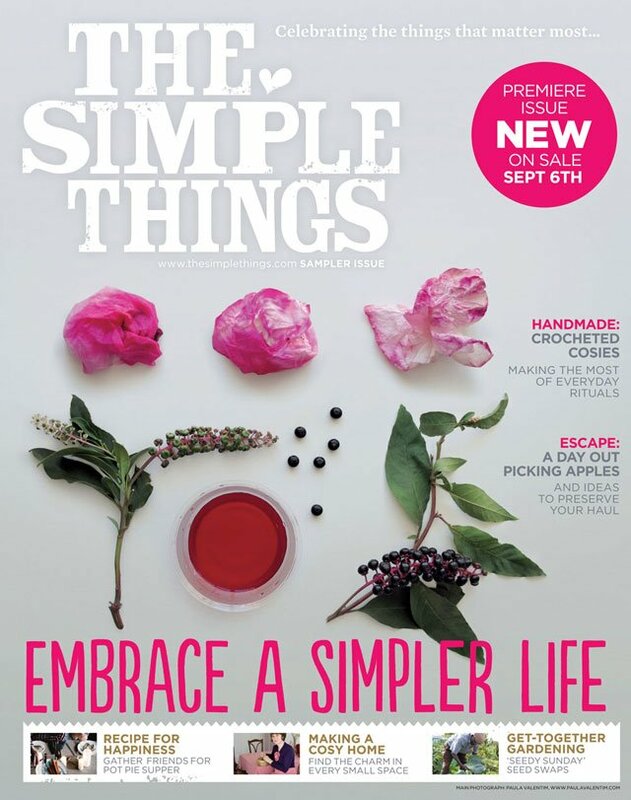 The team behind Mollie Makes magazine has delivered a new title of the printed variety called The Simple Things, a new monthly title celebrating the things that matter most. "It's about knowing the greatest rewards come from the simple things, that there's no satisfaction like that at the end of a long muddy walk, no pink so pretty as freshly-cut rhubarb and no perfume to compare with your own home-grown flowers," say the editors. "It's about making warm, inviting homes - big or small - sharing food with friends, growing your own vegetables. It's about shopping for a coffee table only to find you're happy with a tea chest. It's keeping your Dad's old typewriter just because it's beautiful. It's an empty beach on a Sunday morning. It's backpedalling." Sign us up! The first issue is out September 6. 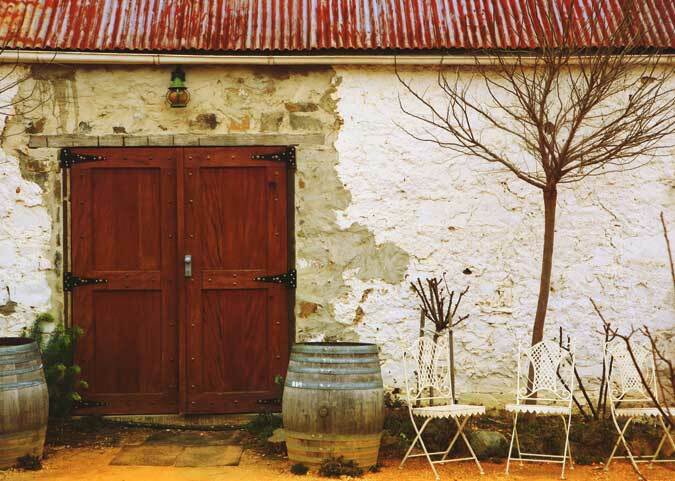 Australian Traveller magazine has produced a state-by-state guide to the best rural regions to eat, drink and forage in it annual gourmet issue. Hit the road and discover fresh provincial produce by way of roadside farm gates, local providores and a flourishing restaurant scene. 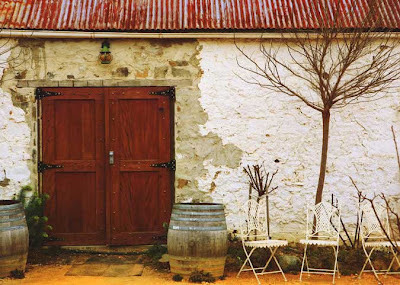 Given the abundance of wineries and cellar doors en route, cosy sleepover options are also provided. There’s no time better than winter to polish off your basket-full of (edible) souvenirs.